Today in Masonic History Henry Harley "Hap" Arnold is born in 1886. 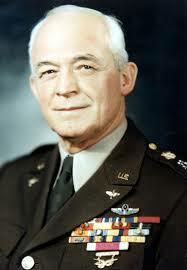 Henry Harley "Hap" Arnold was an American General. Arnold was born June 25, 1886 in Gladwyne, Pennsylvania. Arnold's father was a Baptist and Arnold himself was going to go to school to become a Baptist minister. When Arnold's brother defied their father and refused to take the test to get into West Point, Arnold took the test. He was second on the list of candidates and would be posted to West Point when the primary candidate revealed that he was already married, which was prohibited by West Point at the time. Although Arnold had intended to follow along his fathers faith and become a Baptist minister, Arnold's personality followed his mother's. Arnold's mother was known as a fun lover, especially compared to Arnold's father. It was this influence that probably led Arnold to become one of the founding members of the "Black Hand", a group of cadet pranksters. Arnold graduated from West Point 66th out of 111 cadets. This caused Arnold not to get the posting to Cavalry that he wanted. Instead he was posted to infantry and, after some protests on Arnold's part, be assigned to the Philippines. It was in the Philippines that Arnold would meet and assist Captain Arthur Cowan. Cowan would later be assigned to find pilots for the Army Air Corps (then a part of the Army Signal Corps). He would immediately think of Arnold. After two years, in 1911, Arnold would attend aviator school in Dayton, Ohio. Though individually instructed, Arnold's class contained another Army officer, a Naval officer and 3 civilians. In 1913 he would be recognized as one of the first 24 military aviators, entitling them to wear a new created Military Aviator insignia. In 1912, during an exercise, Arnold would have a near fatal crash. He grounded himself and immediately requested a leave of absence. Because of the high risk nature of early Military Aviation, no stigma was attached to such a request and his leave of absence was granted. During his leave he would become reacquainted with Eleanor "Bee" Pool, the daughter of one of his fathers patients. The two would be married in 1913. By the time World War I had started, Arnold was back flying. He had been assigned a command responsible for setting up an airfield in the Panama Canal Zone. Arnold was heading to Washington D.C. from Panama by ship when the United States declared war on Germany. Arnold's arrival in Washington was poorly timed. He was immediately assigned to military command in Washington, rather than traveling to France as he had requested. Arnold would eventually make it to the battlefield of World War I, unfortunately for Arnold it would be on November 11, 1918, the day of the Armistice. In 1938 Arnold was appointed the Chief of the Air Corps. This was after some political wrangling that had been going on for years regarding the fate of the Air Corp. A rift had been created within the ranks of the Army and the Air Corp as to whether the Air Corp should be separated out and turned into it's own autonomous branch of service. The rift would continue on after his appointment and would extend to the White House. In 1941 President Roosevelt refused to send Arnold's name to congress to officially be promoted to major general. It wasn't until Arnold was sent on special assignment to England for three weeks and gave his official report to Roosevelt that the President changed his mind and sent the nomination to congress. If Roosevelt had not sent the nomination, Arnold would have had no choice but to leave the service. In 1944 Arnold was made a five star General of the Army and would be in command of all United States air forces. During World War II Arnold served with distinction and would receive 26 decorations from foreign countries for his service. In 1949 Arnold's designation was officially changed to General of the Air Force making him the only person to ever hold the rank of five star general in two branches of military service. Arnold was a member of Union Lodge No. 7 in Kansas City, Kansas.